Different Worlds back issues #2 thru #17 and #31 thru #46 are still available. All available issues are straight from inventory and are in mint to near mint condition. Click here for a great index to Different Worlds by Shannon Appel. Click here for the scan of the original "My Life & Role-Playing" follow-up solicitation letter from late 1978. Back in the late 1970s, every major hobby game company had an in-house magazine to help promote their products. Avalon Hill was the pioneer with their General. SPI had Strategy & Tactics. TSR had The Dragon. Even Metagaming had The Space Gamer. These magazines were called "house organs" although most covered other companies' games. Since we were ambitious, Chaosium decided to publish our own magazine devoted to role-playing games. With Greg Stafford and Lynn Willis's blessing, I volunteered to be the editor/publisher. Our house organ would cover not just Chaosium games, but all role-playing games. I asked for title suggestions and Steve Perrin came up with Different Worlds, evocative of the various fantasy and science fiction environments covered by role-playing games. To provide content for the first issue, I invited all the prominent game designers and role-playing personalities at the time to submit a "My Life & Role-Playing" article. The response exceeded expectations and many heart-felt articles were submitted. 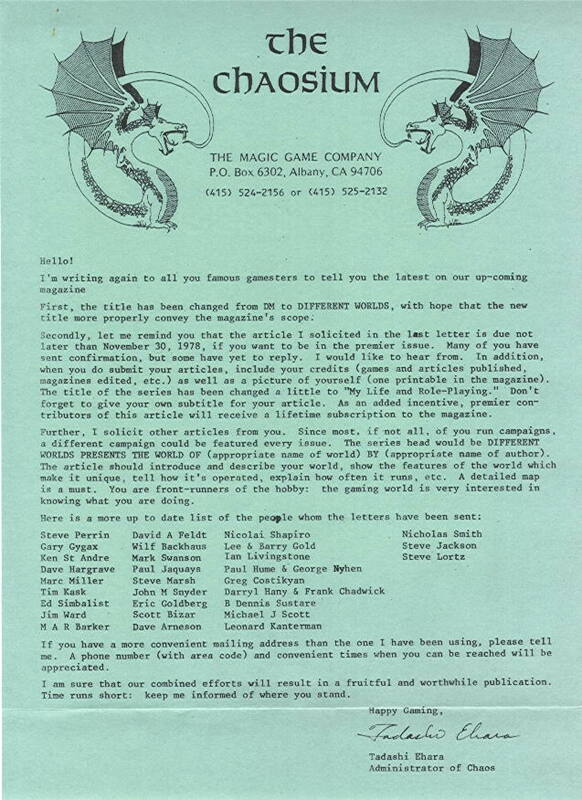 The premiere issue of Different Worlds debuted in early 1979 with articles from 13 of these members of the role-playing world. Many others followed in subsequent issues. To my chagrin, Greg Stafford himself has never contributed to the "My Life & Role-Playing" series. The premier issue also launched another popular series. "Different Worlds Presents" introduced the world settings of various role-playing games. The first was "Archaeron," Ed Simbalist's Chivalry & Sorcery campaign world, complete with his own hand-drawn map. I believe the initial print run of Different Worlds #1 was 1500 copies. It sold out quickly so we reprinted another 1000, which also promptly sold out. It is also the first Chaosium publication to be typeset. Different Worlds #2 marks the first appearance of "A Letter from Gigi," arguably the most famous and infamous gossip column in the industry. It was my great pleasure and privilege to edit Gigi's letters in every issue that has appeared since then. At Chaosium, I spent half my time with business matters and half my time publishing. For publishing, half was devoted to Different Worlds and the other half publishing products. In a good year I published six issues of Different Worlds and two Chaosium products. Different Worlds itself added 10-15% to Chaosium revenues in magazine and advertising sales. I also estimate that it raised Chaosium product sales by another 10-15%. It was never a moneymaker by itself. But it was worth it. Shopping Cart provided by PayPal. Credit cards accepted via PayPal. Send mail to webmaster@diffworlds.com with questions or comments about this web site. Copyright © 2011. Different Worlds Publications.